Doug Munroe established Waterfall Farm in 1976. Doug began back yard sugaring in 2006, tapping a few maple trees close to the house, and boiling the sap down on his wood stove. The project has grown and evolved into one of only a few commercial maple syrup operations in the state. Wheeler partnered with her father in the maple enterprise in the fall of 2012, and Michael joined the team in 2014. They've been working their butts off expanding their infrastructure of tubing and taps, putting up firewood to fuel the wood fired evaporator, and boiling down literally tons of sap to be left with precious golden gallons of perfect and wonderful maple syrup. About 450 taps and several hundred trees are connected by a system of tubing and pipes which flow down into large tanks where the sap is collected. Both sugar and red maples are tapped for their sap which comes out of the trees looking about like water and tasting only very mildly sweet. The sap has an average sugar content of about 1.5% - 2%. On Waterfall Farm, it takes about 55 gallons of sap to make a single gallon of syrup. Sap runs are dictated by temperature and season. In late winter, February being prime in this region, the sap will run in maple trees when a big thaw follows a hard freeze. As the trees begin to pull out of their winter dormancy, stored sugars from last summer's sun are loosened as the tree prepares for spring growth. Usable sap is harvested and cooked in this delicate window of time between the full dormancy of winter and the irrepressible exuberance of spring growth. Once the trees break bud in early spring, their sap is no longer suitable for making maple syrup. 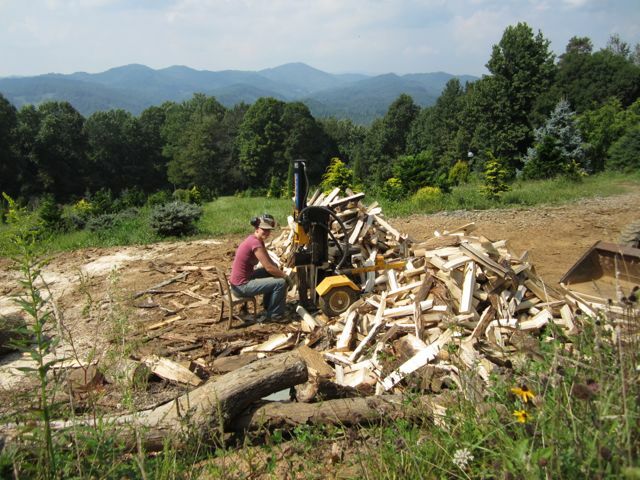 An enormous amount of firewood is needed to fire the evaporator. Tulip poplar is the favored fuel, prized for its fast and hot burning properties. The farm was logged in the 1960s and the forest that grows there today is rife with maturing poplars and other fast growing trees common to first generation forests. Also naturally abundant are maples, beech, hickory and oak to name a few. Selective thinning of the forest reduces competition for maple trees and provides timber for building and firewood. The sugar house was built in 2010 with lumber milled onsite, from timber cut on the farm. The sugar house was built mostly over a nine day period with the generous help of friends and family, and was funded in part by a RAFI grant. Special thanks to builders Steve Sobieski and Jack Lawless without whose help we'd still be boiling sap in the rain and snow. Thanks also to Aaron Floyd for tailoring the building plans for the sugar house to our site. In our 2013-14 season, our hats are off to farm titan, Will Thomas, for harvesting timber and releasing our next generation of sugar trees. Our lovely sugar house. Hinged doors on the sides of the cupola are opened to vent steam from the wood fired evaporator inside. When the evaporator is cranking full tilt, it is converting more than 70 gallons of water into steam every hour. Running the evaporator is a careful and focused task. It takes about an hour and a half to get the evaporator up to temperature at the beginning of each boil. When a boil is underway, fresh sap is entering one end of the evaporator and traveling back and forth in a lazy river fashion around a series of baffles and convolutions which dramatically increase the efficiency of the boiling and steam making process. 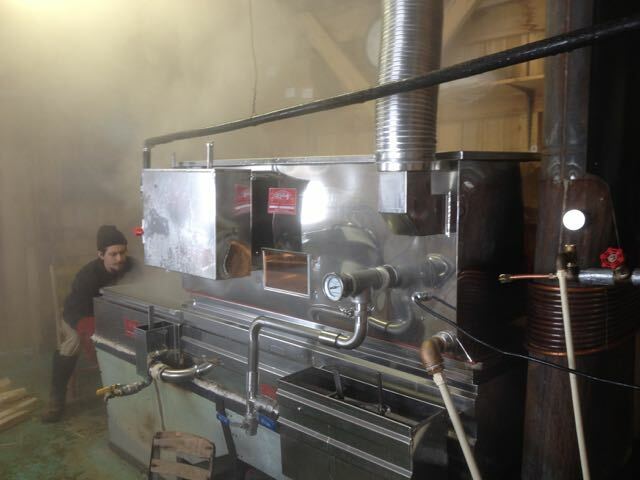 Making maple syrup is a purely evaporative process. As previously mentioned, it takes about 55 gallons of sap to make a single gallon of syrup, so the evaporator is designed to be a highly efficient steam making machine. The sap cooking in the pan is traveling on a concentration gradient, with the fresh sap entering the pan at a sugar content of about 1.5% - 2%. When the syrup is drawn off at the other end, it has a 66% sugar content. While cooking, the evaporator must be relentlessly monitored. The fire is stoked about every 5-7 minutes minutes and the level of sap in the pan must always be kept just so. If the level gets too high, then it cools the pan, slowing evaporation, and if the the level gets too low then there is danger of burning the near syrup in the finishing pan. When running optimally, the evaporator generates about a gallon and a half of syrup per hour. The temperature of the near syrup is closely monitored at the point in the pan where the syrup is drawn off. Although it varies due to elevation and barometric pressure, the syrup is usually ready when it is 8 degrees above the temperature at which water boils. This temperature is used as a reference. When this temperature is reached, a sample is drawn off and a hydrometer is used to to measure the specific gravity of the syrup identifying when the syrup has reached a sugar content of precisely 66%. When the syrup is ready, it is drawn off, filtered, reheated, and bottled.